Why Didn't More Women Vote for Hillary? Hillary Clinton was the strongest female presidential contender ever. Why didn't more women vote for her? Clinton supporters rally for their candidate in Yankton, S.D., the day before the state�s primary. Amy Klobuchar was a swing voter this year. At the outset of the 2008 race, the 48-year-old Senator from Minnesota was exactly the kind of voter Hillary Clinton's campaign was counting on. Women a generation older would be safely in their camp. 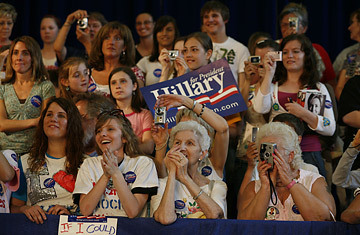 Younger women would be susceptible to Obamamania. Clinton's team thought that those in Klobuchar's demographic--professional, well-educated women who came of age during the modern women's movement--would be moved by the very real opportunity to put one of their own in the White House.